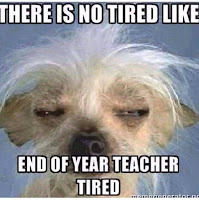 Have you started your end-of-the-year countdown yet? I always get confused if it says "x more days"... does that include today? So I used the number of days left that I have to drag myself out of bed at 5:30 am wishing that I'd gone to bed earlier. In my precalc class we're learning a little about limits. It's actually a nice way to end the year; it's something that these kids will see next year (but have some familiarity with) and what we're doing with limits isn't super complicated. We've spent a lot of time looking at graphs, creating tables, and talking about why a limit may not exist. Tomorrow's quiz is my all-time favorite because it has the cool scratch-off question (ala the fabulous Sam Shah). I just spent an hour or so revamping my beginning of the year student survey. This year I added a part 2. Using FormMule (a google sheet add-on), I'm sending an automated email to their parent once the student submits the form. Just a nice little welcome. The cool thing is that using FormMule, I can customize the email a bit. It will enter both the student's name and class where indicated. You'll see at the bottom of the email a link to a Parent Survey for them to fill out if they'd like to give me more information about their son/daughter. I woke up to a parent email the other day. Not only is it summer right now (so I don't have any students), but this was the parent of a student I'd had in class two years ago. This parent happened to be reading Education Week and ran across an article that I was interviewed for a few weeks before school was out. I was flattered that they thought to send the link to me, especially since the author had promised to but hadn't yet (she did later that afternoon). And not only was I mentioned often in the article, but my picture was on the top! Crazy. Here's the link to the full article.